Cathay Pacific and Boeing announced today that they are donating the first-ever Boeing 777 airplane to the Pima Air & Space Museum in Arizona, one of the world's largest facilities devoted to celebrating aerospace. The iconic 777-200 airplane (line number WA001 and registered B-HNL) will fly from Cathay Pacific's home airport in Hong Kong to Tucson, Arizona on 18 September. The jet will be displayed permanently at the museum alongside more than 350 other historic aircraft. Cathay Pacific Chief Executive Officer Rupert Hogg said: "As the world's very first 777, B-HNL holds a very special place in the history of both our airline and that of commercial aviation, and we are very pleased it will soon bring enjoyment to enthusiasts at its new home in Arizona. "Our 777-200 aircraft have served us exceptionally well over the last two decades, and as we progressively retire these over the months ahead, we eagerly look forward to welcoming the state-of-the art 777-9 aircraft into our fleet from 2021," he added. 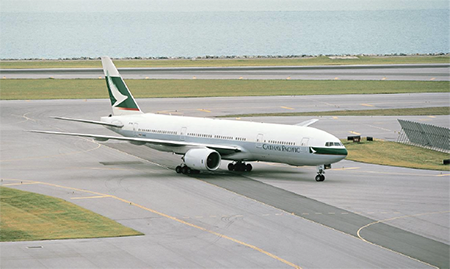 In the 1990s, Cathay Pacific was one of a handful of airlines to provide input for the 777 at the design stage, which gave Hong Kong's home airline a unique opportunity to refine the aircraft's features to suit its needs. Among the requests were a cabin cross-section similar to the 747 Jumbo Jet, a modern 'glass' cockpit, fly-by-wire system, and, crucially, lower operating costs. Today, Cathay Pacific operates one of the largest 777 fleets in the world. Boeing Commercial Airplanes President and CEO Kevin McAllister said: "Cathay Pacific has been instrumental in the tremendous success of the 777 programme. The airline contributed greatly to the airplane's original design and has been one of its biggest ambassadors ever since. And now they are a launch customer for our new 777X airplane. We are thrilled to partner with Cathay on this donation to the museum as a way to share the remarkable story of the Boeing 777 for years to come."